More than 70 staff from Lloyds Banking Group joined Countryfile presenter Adam Henson and ex-rugby star Phil Vickery, to support an agricultural open day at Cotswold Farm Park recently in aid of The Princes Countryside Fund (PCF). The team came together from various arms of Lloyds Banking Group to raise nearly £2000 for The Prince’s Countryside Fund, which gives grants to rural projects that support the people who care for the countryside. Its aim is to secure a sustainable future for the countryside by supporting the UK’s rural communities. 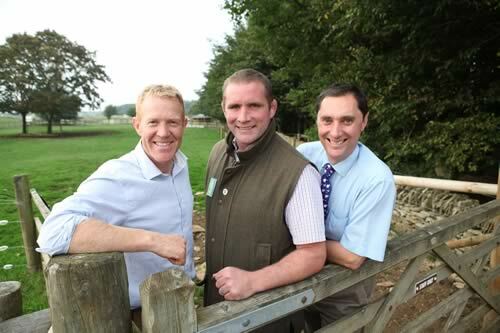 Adam Henson, Phil Vickery (PCF Ambassador) and Alick Jones (Lloyds Bank Agriculture Policy Director). Guests took part in a farm walk hosted by Adam Henson and were given exclusive ‘behind the scenes’ access to his farm which regularly features on Countryfile. Together with his business partner Duncan Andrews, Adam demonstrated how highly technical, modern farming can be efficient and sustainable, whilst emphasising the important role it plays in feeding a growing population. Adam is a longstanding farming customer of Lloyds Bank’s agriculture business and has been its farming ambassador since 2010. He works in close conjunction with the Group’s agricultural teams in Lloyds Bank and Bank of Scotland helping to heighten awareness and understanding of the importance of financial and environmental sustainability within the farming sector. Attendees also heard from PCF Ambassador Phil Vickery, who explained the essential role the PCF plays in helping to tackle on-going issues faced by the agricultural sector including rural isolation, lack of access to training and low farming incomes. Lloyds Banking Group has a strong heritage with the agricultural sector and supports farming across the UK through specialist teams in Lloyds Bank and Bank of Scotland, and long term finance provider the Agricultural Mortgage Corporation (AMC).